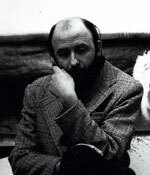 Petr Ivanovich Belenok has a special place in the alternative avant-garde culture of the 1960's as the acclaimed pioneer of photorealistic strategies. His discoveries first appeared almost at the same time as European photorealism and hyperrealism of the post-war American school came into existence. In jest, he called his own artistic system 'panic realism' as his compositions were brimming with countless human figures escaping and flying. They inhabit cosmic spaces, pursued by phantoms, Medusa-like plasmas, multiplying like clowns in a fantasy film.